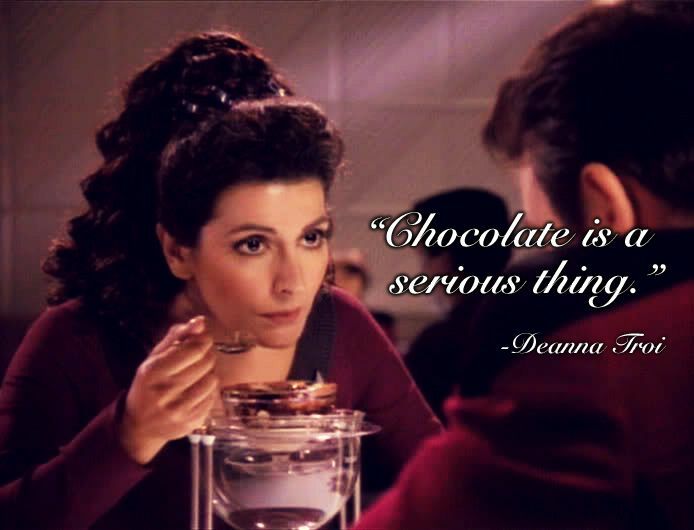 Also, I know that the replicators on the Enterprise-D are supposedly able to remove the “bad” parts of food (thus the development of synthehol) but Deanna? Guuurrrl, there’s no way they can make junk food nutritious for you, you gotta ease up on those chocolate sundaes. Although, to be fair, I’m pretty sure most paleo people would agree with her statement here. Last year I attended a speculative fiction writing workshop with a story I wrote exploring some issues of human nutrition and how it might be affected by interstellar travel and colonization. The story is still a work in progress, but everyone who read it commented about how they had never seen a science fiction story that addressed such issues before. Many of them also said that the idea itself had never even occurred to them in the first place. I take this as further evidence that the rules and realities of nutrition are largely a blind spot in this field. But it seems that as our wider culture is becoming more and more cognizant of nutrition and how it relates to health, this blind spot is gradually dissolving. Objective: Vitamin D has been proposed to have beneficial effects in a wide range of contexts. We investigate the hypothesis that vitamin D deficiency, caused by both aversion to sunlight and unwholesome diet, could also be a significant contributor to the triumph of good over evil in fantasy literature. Design: Data on the dietary habits, moral attributes and martial prowess of various inhabitants of Middle Earth were systematically extracted from J R R Tolkien’s novel The hobbit. Main outcome measures: Goodness and victoriousness of characters were scored with binary scales, and dietary intake and habitual sun exposure were used to calculate a vitamin D score (range, 0–4). Results: The vitamin D score was significantly higher among the good and victorious characters (mean, 3.4; SD, 0.5) than the evil and defeated ones (mean, 0.2; SD, 0.4; P < 0.001). Conclusion: Further work is needed to see if these pilot results can be extrapolated to other fantastic situations and whether randomised intervention trials need to be imagined. Yes it is partially a joke, but they used some actual scientific methods to analyze the material objectively. Also note, a P value of less than 0.001 is nothing to sneeze at. It also has the important effect of bringing up the importance of good vitamin D levels from sunlight exposure and healthy diet in public awareness and discussion (which I suspect is the entire reason the article got published in the first place). For me, though, this study does double-duty by reminding us that fantastical worlds are subject to laws of nature as much as they are laws of physics. Perhaps if we have more discussion of health and nutrition in our stories, then it will be easier for some people to also think about them in the course of their daily, real lives. I have been watching A HELLLLA LOTTTTA TNG recently. I never saw them as a kid, as my parents were staunchly anti-television folks. My boyfriend is a huge fan, so we have been watching through them together as time allows. I am only on season 3 at the moment ,but I too have been thinking about how food is portrayed and used in the episodes, although my ruminations have been less focused on content/nutritional composition and more on the way food functions in the various cultures we encounter. I love to see what the various alien cultures eat and how that reflects various things about them. The episode where Riker goes on an exchange program to a Klingon ship and is offered gagh is one my favorites. I have also noticed that there is usually some overture made to add the recipes of other cultures to the program of the food replicators to make visitors to the Enterprise feel more welcome. As an International Relations expert, I love this focus on food as an entry point to understand and reach out to other cultures. It also seems to me that the joys and rituals surrounding creating and sharing a meal together is a bit lost with the use of the food replicators. I guess they hang out and socialize in Ten-Forward, but eating sometimes seems to be a solitary action. Your comment about the simple cultural implications of food and food sharing is super spot-on too. I too have often thought how different it must be to not have restaurants or go through the process of making food for loved ones, although I guess *some* people still do their own cooking for fun (Keiko’s sea-berries and kelp-loaf come to mind, again another thing that when I saw that episode now, as a paleo person, I was like AW HELL YEAH IODIIIIINE AND TRACE NUTRIENTS! ).